2 weeks ago, Jon walked in the door from work and he greeted me in the kitchen with a kiss. I looked at him and said, "Babe, can we sit down and talk?" I'm sure he thought, "Oh crap." But he lovingly grabbed my hand and we headed to the living room couch, which we only use for "those talks." We sat down, Jon held my hand, I looked into his eyes and said, "I think I'm tired." Jon knew exactly what I was saying and he nodded. "I feel like I'm losing steam," I said next. And he nodded again. I continued, "I feel like my plane is wanting to land - but it's not landing in a beautiful, warm, tropical island. :) I feel like it wants to land in a big, dark pit. I don't want any part of that. But I'm just... tired." He sat with me for awhile. He accepted me in my honesty. He didn't try to fix it. He didn't make promises. He didn't even try to say an 'encouraging word.' He was just present. Partly because he's awesome like that. And partly because he's tired too. He feels the same way. We had just spent the week at CHOC (Children's Hospital of Orange County) where our 3 year old had been admitted due to low oxygen levels and respiratory issues. She was put in an isolation room where the doctors and nurses only entered with full "protective clothing" on. (Not sure what to call it when they have to get "suited up" each time they enter the room and then throw away their "suit" each time they leave the room. Hazmat suit, anyone?) ;) They told us after the wide panel of tests, everything came back "negative." Their bottom line was that Morgan had a virus. They didn't know which one, but they assumed it was a rare, bad virus. They said there was no way to treat the virus. Keeping her hooked up to oxygen was about the only thing they were able to do to help her breathe. But other than that, we would just have to wait and see. Wait and see how her body fights. Or doesn't fight. Time would tell. 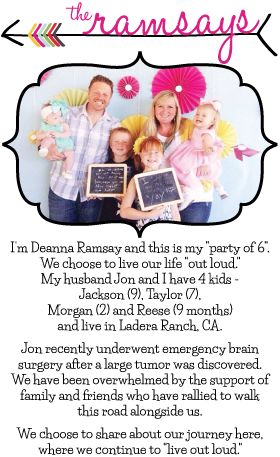 One year ago, Jon was admitted to the hospital with a brain tumor. Now almost 365 days later we were there with our 3 year old. For the first time, in a year filled with Doctors and hospitals and appointments, I needed OUT. Stat. Jon took one look at me and said it even before I did. "Um, babe, why don't you go. You need to get out of here, I think." He was right. Too right. I needed to get outside of the walls of that blasted hospital. And I needed to have words. With God. Out loud words. I walked out to the parking lot, taking deep, like-you're-in-labor breaths the whole way. I had barely made it inside my minivan before I started in.. with intensity. "God, I cannot do this. I can't. CAN. NOT." And then I said it. "If you think this is going to be some great way for me to put you on display and be used for your glory, YOU ARE MISTAKEN." It felt like the air got sucked out of the van. Kind of how it feels right now as I type this. I am embarrassed to admit those words came out of my mouth. But in an attempt to "live out loud" and continue in this journey honestly, I confess them. It's not that I don't think God can't handle my exasperation. It's just that I've never so blatantly said "No" to God before. Oh, I've said "no" many times. But it was always more subtle. ;) Choosing my own way... Not obeying... Pretending like I didn't hear Him... Manipulating circumstances to make them "work out"... But never have I just said, "No." Verbally. I drove around the parking lot just waiting for a giant whale to swallow me up. I immediately felt guilt. But not enough to make me take my words back. My flesh and my spirit were at war. Everything in me wanted to live my life open handed. In theory. I want to choose Jesus every day of the week and twice on Sunday. But I was also facing off with my fears. My desires. And still in the process of learning what it looks like to live a fully surrendered life. Fast forward back to the couch a week later. I realized that I'm just plain tired. And I think it's because my reserve is low. You know when you have a full tank (in life) and you get normal, every day hits? They don't seem to do all that much "damage" when your tank is full. But when your tank is low, those events don't seem like "normal, every day" hits. They feel like huge blows that deplete whatever reserves you had in there. So you feel helpless, exasperated, desperate with each life event. The baby has a rash? Of course she does. Your homework isn't done yet? Lovely! You spilled nail polish where?!? UGH! And then there was the water heater that went out, the child that came home from school with lice and the other one who had it 2 weeks later. Each life event felt like a fatal blow. So when Morgan went into the hospital, it just about did me in. I don't have what it takes to have a sick child right now. Taylor was crying at school because Lord knows all this hospital business has taken an emotional toll on her. Jon's trying to juggle work and school and an eyeball that puts him in debilitating chronic pain. And I'm getting emails from speaking engagements I'm booked for, asking for a current "head shot" for their promotional material. Head shot? If you could see my face right now, you would probably cancel me as your speaker! ;) But we trod along. A friend takes a updated picture of me and uses all the photoshop she can muster. My in-laws babysit. (and wash the car and do the laundry and... and...) God provides. Just enough. The awkward part, was I had been booked to speak at an event a few weeks after my "minivan meltdown" and only few days after the "couch confession." I was booked to speak and I felt like I had nothing to say. I contemplated canceling. I told God, "I have nothing to give these ladies." And do you know what God said back to me? "You have nothing to give. But I do. So give them Me." "Um, I'm gonna need you to try and not teach them anything right now." He said. "Seriously. Just give them me. Tell them about me. That's it." So I did what He said - only because I really didn't have any other options. And you know what? That experience changed me. It was like God was saying, "Your eyes have shifted. Shift them back to me. You're trying to give everyone more and more of yourself. Stop. You don't have anything to give them. Give them me instead." Do you know how freeing that reminder has been? The ladies at that event will tell you, I didn't try to "teach" them one single bullet point. I just told God's story. My friends will tell you, I've stopped giving advice. LOL! I just trust Jesus to speak to them and point them to Him. My kids will tell you, I've stopped refereeing their fights and whines and complaints. I kid you not. Do you know what I said when Taylor came downstairs after bed time, complaining about something Jackson said to her? "Taylor, I love you so much. God loves you so much. 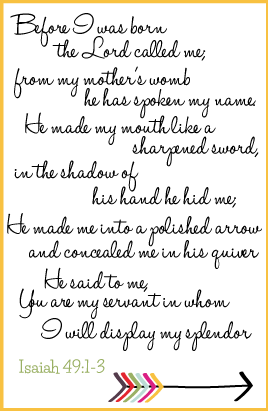 God made you so special. He has such great plans for your life." It was almost comical to see her reaction. She looked puzzled and said, "What does that have to do with Jackson saying..." I interrupted her. "Taylor, you are SO loved." As I continued to speak words of truth over her, she began to smile. Her demeanor changed. She repeated it back to me, kind of laughing. "Mom, I am SO loved." She went back upstairs a completely different child. And do you know what? I didn't have to parent her out of my deficite! I didn't have to give her what I don't have. I just gave her Jesus. And (surprise!) He was more than enough! I have been quiet here on the blog because I just couldn't muster up the energy to try to process all of the feelings I've experienced over the past few weeks. I'm not even certain I've done a good job of it here, but I felt like I needed to try. And, honestly, it took me a bit of time to muster up the cajones to write this. There's nothing enticing about telling people that you're tired, losing steam, and "lost it" with God. But it is what it is. Brutal. Real life. I do, however, feel SUCH freedom in giving people Jesus instead of me. I know. Duh. But sometimes we forget. Sometimes we start to believe that we should be enough. How quickly I was reminded that I'm robbing people (friends, strangers, husband, kids) of SO much by just giving them me. Would you continue to pray for Jon and I? :) That God would continue to sustain? That we would be patient in affliction? That we would seek to fill ourselves with Jesus and pour only Him (and not ourselves) out into the world around us?